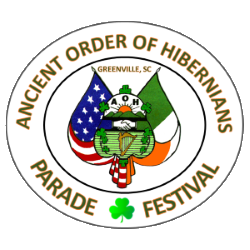 The Harp and Shamrock, Division One of the Ancient Order of Hibernians sponsors the St Patrick’s Day city parade in downtown Greenville, South Carolina, on the closest Sunday afternoon to March 17th, so that working people and families are all able to attend and enjoy the festivities. The parade is a family oriented tradition of honoring St. Patrick that is routed on Main Street beginning at 1 PM. Every year we get many requests to enter a float or group in the parade, as well as individuals and local businesses desiring to sponsor the parade and festival advertising in the local media. 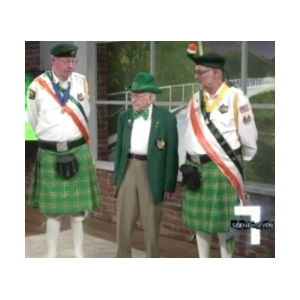 In 1836, a contingent of miners formed an organization called the Hibernian Benevolent Society traveled to New York's St Patrick's Day parade, the early beginning of the AOH. As a result of historic gatherings and marches, the AOH now stands, not only as the oldest Catholic Lay organization in America, but as the largest Irish Catholic society in the world with Divisions across the United States, and close ties with the AOH in Ireland, England, Scotland, and Wales. 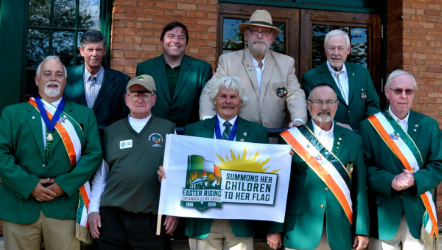 Activities and events sponsored at all levels of the Order raise millions for charity while providing a showcase for the positive contributions the Irish have made in every walk of American life. The AOH serves its Church well, yet, never forgets homeland Eire, and can always be found working for the total independence of a united 32-county Ireland. "To be Irish is a Blessing, To be a Hibernian is an Honor." Membership in the Ancient Order of Hibernians, Inc. is confined to men 16 years and older who are practicing Roman Catholics of Irish birth or descent and who are citizens of United States of America or who have declared their intentions to become citizens of the United States of America. Associate memberships are also available to those who do not meet the aforementioned qualification. Notifications for induction dates and times, through the Shamrock Degree, are sent to all applicants. This video which portrays the history, goals and mission of the AOH.